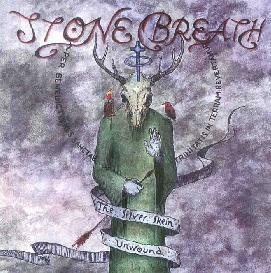 Stone Breath - "The Silver Skein Unwound"
This is the bands 6th release and although I have read articles about them and heard a track or two on compilations, I have never heard one of their CDs. The band consists of three members who play various string instruments (primarily guitar and banjo but also dulcimer and bouzouki), melodica, harmonium, whistles, viola, etc. The music is a sort of dark haunting folk music. The lyrics are really excellent and the liner notes quite nice. "A Bottle Of Breath" has a long intro with some banjo and a sample of a street preacher, before the real song begins. The vocals are both male and female and some of the lyrics are delivered in a spoken word style, while most are sung. The bands bio describes this CD as rural acid folk. A really excellent release. More Stone Breath releases can be found at: http://www.darkholler.com.